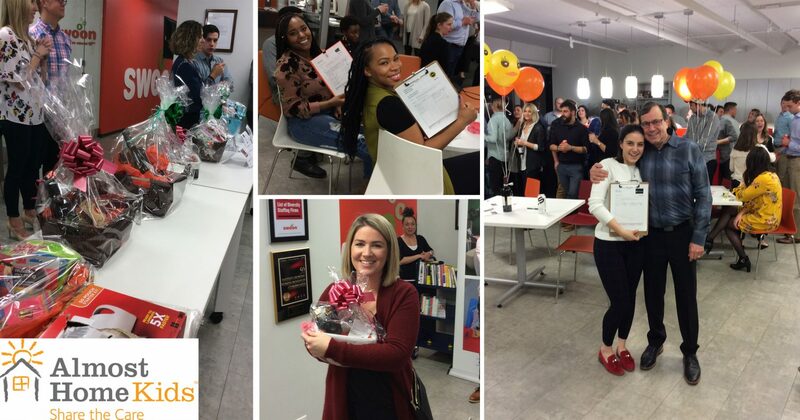 Last Friday, March 23rd, Swoon and NextGen Global hosted our third annual fundraising event to raise money for the local organization, Almost Home Kids (AHK). The event was held in our office space at 300 S Wacker and took place from 5 p.m. – 8 p.m. It included food, drinks, raffle prizes and a silent auction. Our charity committee began planning and gathering donations for the event in early January. We reached out to our friends, family and local organizations to request donations for our gift baskets and silent auction items. Several charitable donors participated, including Beggar’s Pizza who donated pizza for all our guests the night of the event! We had a very successful evening with over 90 guests and several bidding wars on our hot ticket items. Judith Mclean, Director of Marketing & Communications at Almost Home Kids attended the event and gave a brief presentation on the organization and the many ways that it helps families in need. AHK offers transitional care and training to families who are bringing their children home from the hospital with complicated health needs. Swoon is honored to be able to contribute to the costs associated with running the Almost Home Kids facilities. For more information or to see how you can make an impact, please visit www.almosthomekids.org. Swoon Tunes – Friday 5 at 5 – Green, Gold and Luck!